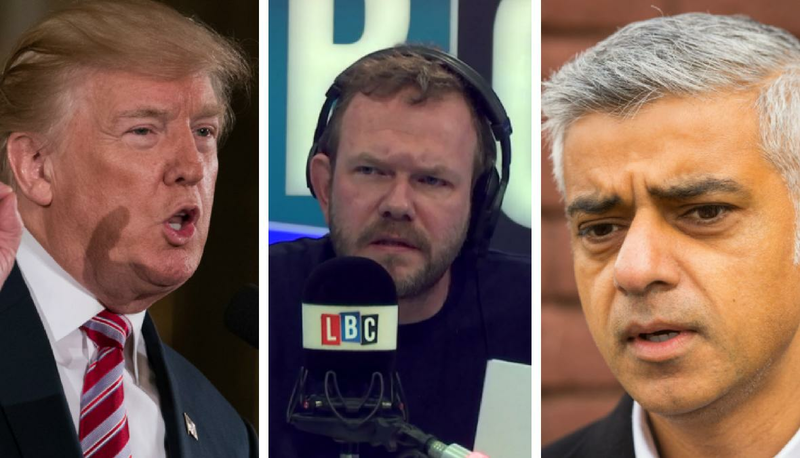 Sadiq Khan has told LBC a planned state visit by Donald Trump to the UK should be cancelled after being criticised by the US President on Twitter. The Mayor of London said Mr Trump was “not worthy” of the red carpet treatment - especially since Saturday’s terror attack in the capital. On Sunday and Monday, the outspoke President took to his social media channel, followed by over 30million people, to publicly lash out at Mr Khan. He accused the Mayor of “pathetic excuses” in his response to the London Bridge and Borough Market atrocity which killed seven. The President also appeared to misinterpret a speech given by the Mayor in the wake of the attack, where he told Londoners “not to be alarmed” if they saw an increased police presence. Giving his reaction to James O’Brien - Mr Khan said he had always opposed a state visit for the President and nothing had changed. He said: “State visits are given to leaders for a number of criteria and I couldn’t think of one that was worthy of him having a state visit. Asked what he made of the confrontational tweets, Mr Khan said: "I haven’t had a chance to give it a moment's thought what Donald Trump is tweeting. “In my normal course of the working week; whether it’s grappling with air quality, whether it’s tackling the housing crisis, whether it’s providing affordable transport or working with the police to keep the city safe.